This past week I was wrapping up a draft of a synthesis paper about constructivist learning theory and its application to educational simulations and virtual worlds. I imagine there’s nothing new about wide-eyed educational technology students wanting an excuse to study games in school. It’s a pretty hot topic in education right now. As for me, I had a rather passive interest until our district’s IT Director approached me last year and asked some questions about how to start using virtual worlds in our district. I didn’t have an immediate answer for him. This became part of the reason I decided to enroll in Boise State’s M.ET. program. I’ve already determined that using Second Life in our school district won’t be possible at this time, due to the adult content. There doesn’t seem to be any way for our district’s firewall to filter specific regions. We could actually customize our own Second Life viewer to whitelist a selection of regions that we’ve pre-approved, but this still won’t stop clever students from realizing they can download the standard viewer and access the inappropriate regions anyway. Teen Second Life also won’t work, since it’s intended for adolescents from 13-17 years of age, and apparently it’s rather difficult to even get Linden Lab to allow teachers on the site. Plus, none of these sites allow access for students 12 and younger, and the district never directly has any control over the actual content. The requirement for direct control is a policy we won’t be able to get around at the current time. For this reason, the best alternative is to host our own virtual world server. 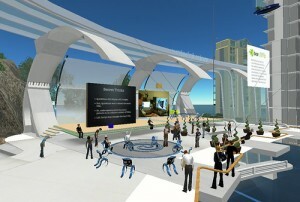 OpenSim, an open source re-engineering of Second Life, appears to be a good bet. Version 0.7 was just released a few days ago with some pretty exciting updates. The drawback to a self-hosted virtual world, however, is that our students won’t have access to the vast array of pre-built regions in Second Life that contain undeniable educational value. What this means is that we’ll need to approach our use of OpenSim from another perspective. This is where learning theories come into play. We don’t have to wildly speculate what the best practices for using a multi-user virtual environment might be. We can draw from a deep pool of theoretical frameworks to make informed, educated decisions about how to create the most effective, engaging, motivating learning opportunities. Our young students do seem to be particularly fond of online gaming in general. 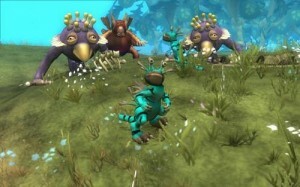 Massive multiplayer online games (MMOGs) have increasingly become the dominant form of entertainment for children and adolescents (Paraskeva, Mysirlaki, & Papagianni, 2010). It seems natural that a self-hosted virtual environment which has in-game modeling and scripting tools would naturally be an ideal playground for allowing students to become creators. Constructivist learning theories are a good fit, as they place the focus on learners, and cast them in active roles responsible for their own knowledge construction. Students can generate shareable artifacts in the virtual world. The teacher supports students’ learning, rather than dictates the information to them, and in the case of a virtual world, this would be accomplished by setting up virtual learning environments in which students can discover aspects the teacher wishes them to learn, and probably a few things they don’t expect, and allocating different tasks to students as they explore, test their theories to solve the tasks, and reflect on their learning. Politics when they encounter rival civilizations and are forced to coexist. When things don’t go as planned, the students reform their hypotheses and test again. Part of this constructivist-based problem-solving model includes periods of reflection. It’s important that students, since they are their own knowledge constructors, have a chance to adequately reflect on what they are learning, and make the proper connections. It’s almost inevitable that games not designed specifically for curricular learning will introduce inaccuracies, since there’s often a trade-off between entertainment value and realism. However, these points of inaccuracy can be teaching moments as well. For instance, asking “How is the evolution portrayed in Spore different from scientific evolution?” could prompt a great discussion in class. Spore is a rather fun tool for hypothesizing and fantasizing about how intelligent space-faring species might evolve, since as of now, humans are the only point of reference. But ultimately this demonstrates the advantage a fully-controllable virtual world provides, where you can design the simulation from the ground up so it follows particular curriculum standards and objectives, rather than having to mold a preexisting game around the curriculum. I’m already considering the changes I’ll make to my paper for the final draft. It’s been nice to be able to draw on my past video game experience (and my parents thought I was just wasting time by playing them!) and adjust my perspectives with a new outlook. While we are discussing about topics relevant to Virtual Worlds and Game-Based Learning Activities, One factor is particular. Kids like them. They invest in and play them in ever growing numbers. Electronic games are here to remain. I stumbled upon your post after I posted yesterday…. Of course I agree with your words totally, I struggle with the “open-endedness” of it all. Though we know it is good for students and good for learning, it is sometimes not structured enough for many teachers to use this medium. I wonder if that bulleted list you have could be developed into specific lessons for those with less time to be able to pick up and do it – a teacher guide with objectives and instructions. Perhaps collaboration on a project would be useful to all educators.